Pour wines into saucepan. Add citrus rinds, jelly, and cinnamon sticks. Bring to a boil, stirring until the jelly has dissolved. Meanwhile, peel the pears, leaving the stalks intact. Since the bottoms if necessary so they stand up straight. Squeeze and rub the juice of the lemon on the pears to prevent browning. Place the pears in the sauce pan with the wine. Bring back to a boil, removing any surface scum. Once the wine returns to a boil, reduce heat to a simmer and cover; turning every ten minutes and spooning the wine over the pears to allow all sides of the pears to absorb the wine mixture. Cook until the pears are tender, about 45 minutes. Remove the pears using a slotted spoon, reserving the wine and set the pears in a heatproof dish. Return wine mixture to the heat and bring to a boil. Reduce heat to medium and cook until the liquid is reduced and syrupy, 15 to 20 minutes. Pour liquid through a sieve to remove any pieces of cinnamon, etc. Allow to cool before serving. 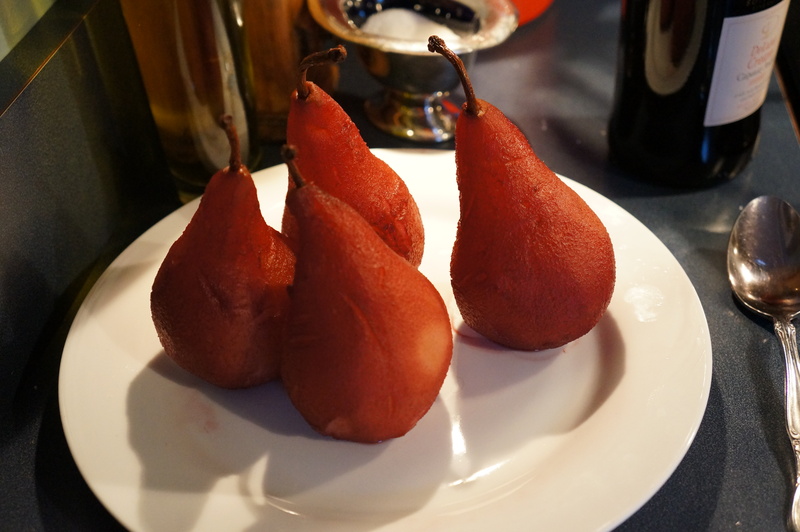 These delicious pears are wonderful served standing straight up with a scoop of vanilla ice cream topped with the wine syrup. They are also a wonderful topping to your salad. Imagine baby field green salad with gorgonzola cheese, a few cherry tomatoes and a few Kalamata olives, topped with the poached pears. So good!! Slice the pear in half lengthways. With a paring knife trim, off the stem and core very carefully, as the pears are very tender. Slice pears lengthways in ¼ inch slices, holding pear intact and fan on top of the salad. Top the salad with a balsamic vinaigrette dressing.